DOVER AIR FORCE BASE, Del. (March 24, 2000) -- Airmen with the 436th/512th Aircraft Generation Squadron spend all day on the Dover Air Force Base flight line correcting problems, or discrepancies, with the C-5 Galaxy Aircraft. 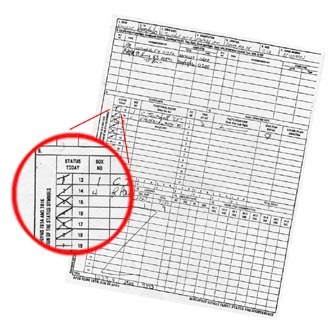 Usually by flight time, most aircraft still have "delayed discrepancies" listed in their AFTO 781 forms binder. These discrepancies do not affect the safety or flight capability of the aircraft. What would happen though, if an aircraft were to go up without any discrepancies at all? Recently, that very thing happened when the first Dover AFB C-5 Galaxy left the ground with "Black Letter Initial Status." A feat that hasn't been accomplished in nearly two years for the base. 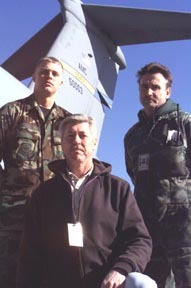 Airman 1st Class Mark Dexter, Charles Twitchell, and Joseph R. Moore, three of the five Dover Team Members responcible for putting up the most recent Black Letter Initial flight. The black letter initial status refers to initials on the aircraft's discrepancy report which indicates the aircraft has no outstanding discrepancies, or repairs to be made, said Charles E. Twitchell, 512th AGS C-5 crew chief. Black initial status doesn't happen by accident though, it takes hard work by all involved to make it happen. "Finding parts on base, knowing where to go, and knowing how to fix things yourself is how we did it," said Twitchell. A black letter initial flight means a C-5 goes into the air without any discrepancies. It gets it's name from the black ink used to sign off on the discrepencies sheet, indicating there are no aircraft discrepencies to fix. Twitchell, who works day shift, was assisted in this accomplishment by four other Dover Team members, including Air Reserve Technician Joseph R. Moore, Airman 1st Class Mark Dexter, Senior Airman Michael Scales Jr., and Senior Airman Chris Moyer, now a Flying Crew Chief. "For instance, we had an engine with the cowl doors opened up. There was a rivet missing. In order to fix that rivet, we would have to drop the door, put a rivet in, and then put the door back on," said Twitchell. "Such a discrepancy would usually be fixed in down time, for heavy maintenance. But with the aggressiveness of this crew, we wouldn't wait. We took it down ourselves, fixed it and put it back up."